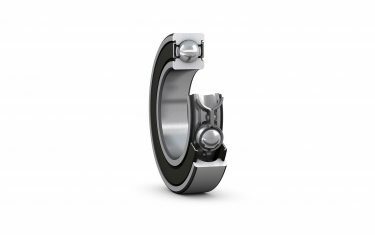 Fan-related bearing problems represent a significant proportion of failures presented to SKF engineers. and axial vibrations.In the US, SKF operates a technical hot line that receives about 1,000 bearing-related phone calls a week. About 600 of these are related to part number interpretation, interchanges, tolerances and other non-application questions. About 400 are related to bearing applications. 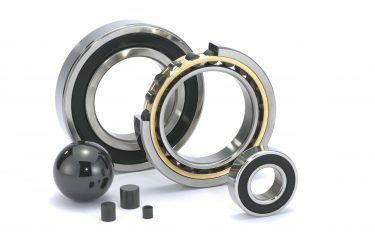 Sixty calls relate to applications where bearings have failed prematurely, are about to fail, or are not achieving performance parameters (usually because of excessive vibration or temperature). Of those 60, some 24 are fan-related problems. This is by far the largest category for bearing failures and problems in the US today. This has led to exploration of the reasons why fans cause so many problems and proposals of general solutions. These are general and conservative recommendations intended to eliminate problems. These four characteristics can interrelate with one another in varying ways. This can result in a bearing application that is prone to failures. Problems can occur quickly and without warning before the machine can be shut down or appropriate action taken. The primary concern related to high-speed bearings is the heat they generate. Heat is generated in three ways in such bearings. First there is the load-dependent friction, which results from the deformation of the rolling elements and the raceways. In high-speed applications, this friction accounts for about 25% of the heat generated within the bearing. Load-independent friction is the second heat source. This is caused by the rolling elements pushing through the lubricant, which accounts for about 75% of the heat generated within high speed bearings. The third source of friction is the seals. 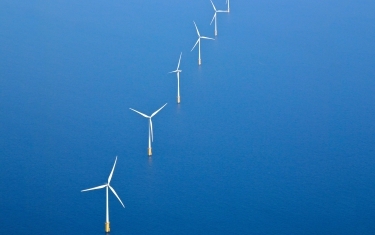 Heat generated by the seals is considered to be external from the bearing. Labyrinth seals contribute negligible heat to the bearing, while rubber-lipped contact seals can generate significant heat (up to 50% of the total). The heat from integral rubber lip contact seals is almost always taken care of through reduced speed limit recommendations by bearing manufacturers. The large proportion of heat generated by the lubricant often leads to the misconception that bearing performance can be improved by changing to a lower viscosity lubricant to reduce the temperature. Certainly a thinner lubricant film will lower operating temperature but this is at the cost of film thickness which can be considered as a safety factor for a bearing. Although the temperature may be lower, the separation between rolling elements and raceways is reduced and bearing life is sacrificed. Elevated operating temperature generally creates a higher temperature for the inner ring of the bearing than for the outer ring since the outer ring can more readily dissipate its heat. The temperature difference between the rings results in greater thermal expansion of the inner ring when compared with the outer ring. This results in a reduction in radial internal clearance inside the bearing. If this reduction is not accounted for by using bearings with increased internal clearance as a pre-load condition, then increased friction and added heat could be the consequence. For this reason increased clearance bearings, designated with suffix C3, should always be considered in any high-speed application. Another characteristic of high-speed bearings is their sensitivity to unbalance. Centrifugal forces increase by the square of the rotational speed so that unbalanced forces can become significant at high speed. This issue is discussed later under light load restrictions. There are several important factors to consider for high-speed bearings. The primary one is lubrication. The bearing must have an adequate film of lubricant at its operating temperature. For operating temperatures up to 80 °C, it is recommended that standard mineral-oil-based grease is used. For operating temperatures between 80 °C and 100 °C, it is recommended that a synthetic oil-based grease is used. For operating temperatures above 100 °C, a circulating oil system with cooled and filtered oil is preferred so that bearings receive a continuous supply of clean, fresh oil. Molybdenum disulphide lubricants should be avoided in high-speed applications that are sensitive to moisture contamination, however, as the sulphide can combine with moisture to yield highly corrosive compounds. To accommodate the temperature difference between the inner ring and the outer ring of the bearing, it is usually recommended that a bearing with at least one level of increased radial internal clearance be used. These bearings are designated by the suffix C3. In some cases, when high operating temperatures are encountered, air is blown against the outside of a bearing housing to cool the bearings. This usually results in cooling the outer ring much more than the inner ring and results in further reduction in radial internal clearance. This added reduction can yield a pre-load condition that further increases bearing operating temperature. During fan design, the situation sometimes arises where, due to the way the loads balance out, some bearings are only very lightly loaded. This can be undesirable. Rolling elements need load on them to keep them in rolling contact with the raceway so they will not skid when they enter the bearing load zone and damage the raceway. For spherical roller bearings, the minimum load can be considered to be 2% of the bearing's dynamic capacity. fits with the inner ring tight on the shaft to prevent fretting and the outer ring loose in the housing to accommodate axial thermal expansion of the shaft. The centrifugal force that results from unbalance must be less than the applied radial load. This is so that the unbalance force will not lift the outer ring in the housing causing relative motion that will result in fretting corrosion, and eventually spinning. Either will damage the surfaces and generate additional heat. The ratio of the axial load Fa divided by the radial load Fr has a great influence on the equivalent load P – and consequently the L10 fatigue life – of both single row and double row bearings. The relation between P, Fr and Fa depends on the internal geometry of the bearing. The parameter “e” is defined by ISO and is given by virtually all bearing manufacturers as part of the catalog information, and is a function of the contact angle of the bearing. n = Rotational speed in r/min. bearing load increased from 17,793 N to 19,719 N and the resultant life decreased from 33,400 hours to 22,100 hours. This large reduction in life resulted because there was a different method of calculation as the ratio Fa/Fr was below e in the first case and above e in the second. Since spherical roller bearings are radial bearings, they are intended for predominantly radial loads. However, they are also able to support considerable simutaneously acting axial loads. The reduction in L10h life is a reflection of the fact that the two roller rows of the bearing will not be equally loaded under all conditions of combined (radial and axial) load. When analysing vibrations in fan applications, it should be kept in mind that bearings are universal exciters of vibration. This means that the entire rotating and support system must be considered when analysing vibrations and not just the bearings. Vibration measurements are usually measured on bearing housings so bearings are thought of as the primary cause of vibration. High vibration, however, is rarely caused by properly maintained bearings. More often it is caused by unbalance or by the characteristics of the entire system. Bearings have discrete frequencies associated with each of the four main components of the bearing: the outer ring, the inner ring, the rolling elements and the cage. If the bearing has surface damage then a full spectrum analysis will reveal spikes at least at one of these bearing defect frequencies. If a system has excess vibrations the defect frequencies can sometimes be difficult to discern but modern analytical techniques such as “enveloping” – expanding a portion of the spectrum for a close-up look – usually reveal whether or not there is a bearing defect. Bearing defects in radial bearings (virtually all fan bearings are radial) will generate primarily radial vibrations and not axial ones. If a fan application has large axial vibrations then bearing defects can be eliminated as a primary source. If fan bearing problems are to be reduced, what are the future trends? 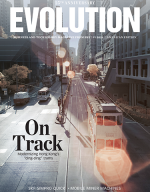 As speeds continue to increase there will be an increasing need for higher-speed bearings. In conjunction with this, loads will decrease. The inevitable choice will be ball bearings. The self-aligning ball bearing, which has already seen some increase in usage, will become even more popular. With high loads and high speeds, the use of circulating oil lubrication will become increasingly common. These currently expensive systems will become more reasonably priced as they are adapted for the fan industry. Use of the two-bearing housing will continue to increase. By supporting both bearings in one housing, alignment is provided between the bearings, eliminating the need for self-aligning bearings and allowing the use of the ideal bearing for high speed – the single row deep groove ball bearing. To eliminate problems with fan bearings it is important to select the correct lubricant and method of lubrication. Increased radial internal clearance (designated by the suffix C3) should be considered. Loads should be kept above the minimum while the limitations of ratio Fa/Fr should be kept in mind. The implications of reduced clearances should be assessed before carrying out direct air cooling on a bearing. Finally, alternative types of bearings should be considered when problems are encountered.